After watching the two women’s matches on the Centre Court, I headed out to watch some of the women’s matches on the outside courts. 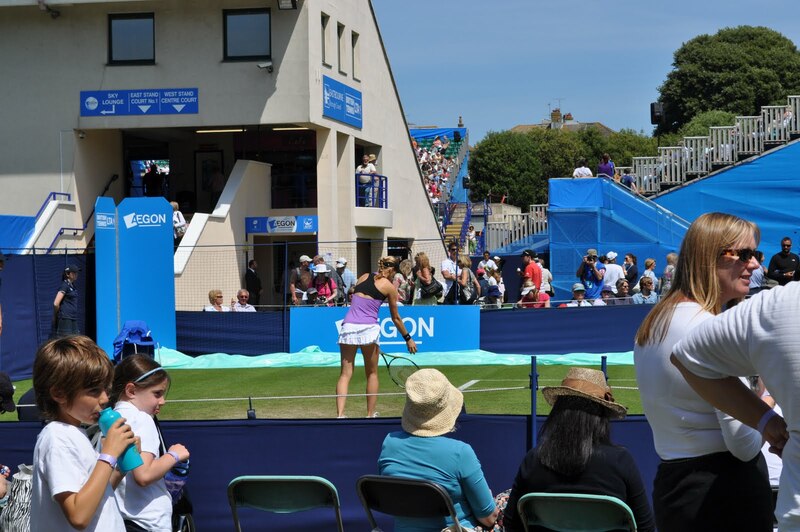 I stood and watched the opening exchanges of Vera Zvonareva and Heather Watson. It was clear to see that there was a large gap in quality between the two, however Watson acquitted herself extremely well. 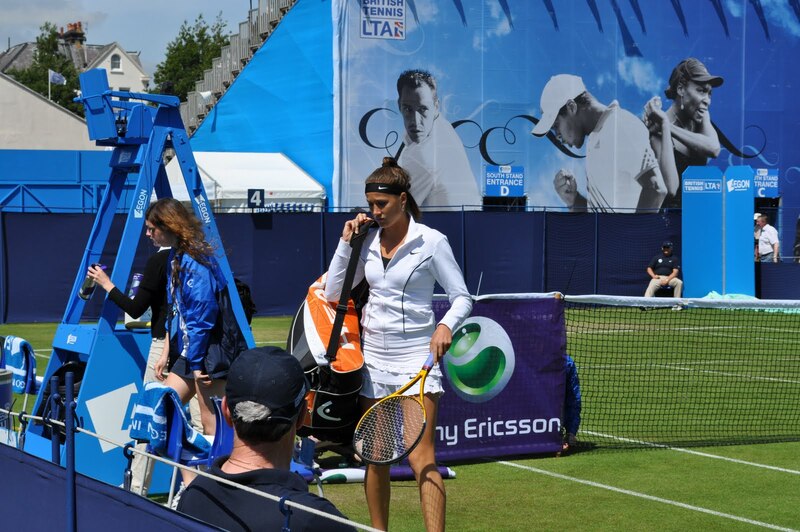 She lacked the power and consistency from the back of the court to challenge Zvonareva. 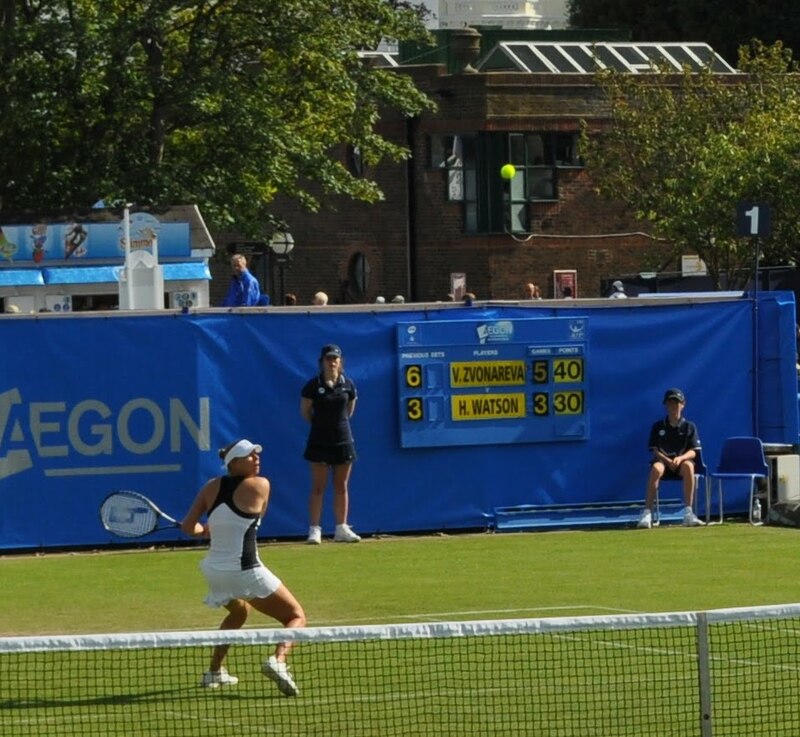 However she showed some clever tactics early on as she broke up the play of Zvonareva with some nice looping shots, which got her back into a number of points – two of them she finished off beautifully at the net. 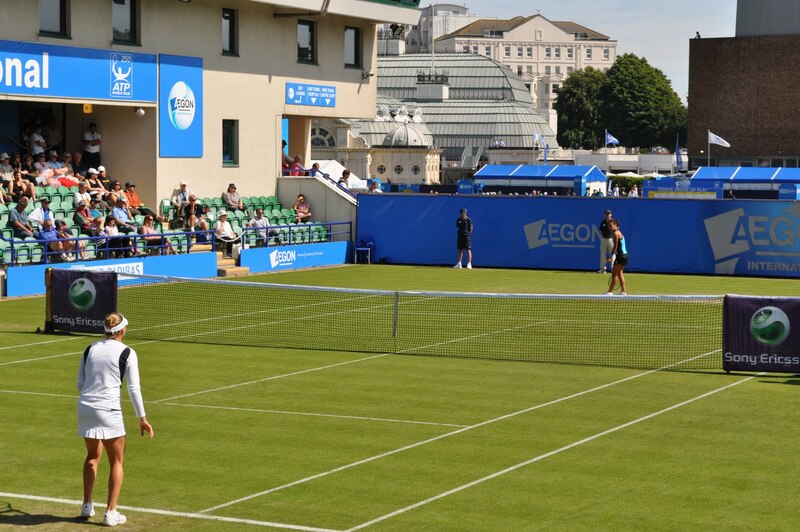 The potential was there for all to see but ultimately Zvonareva ran out a 6-3 6-3 winner. 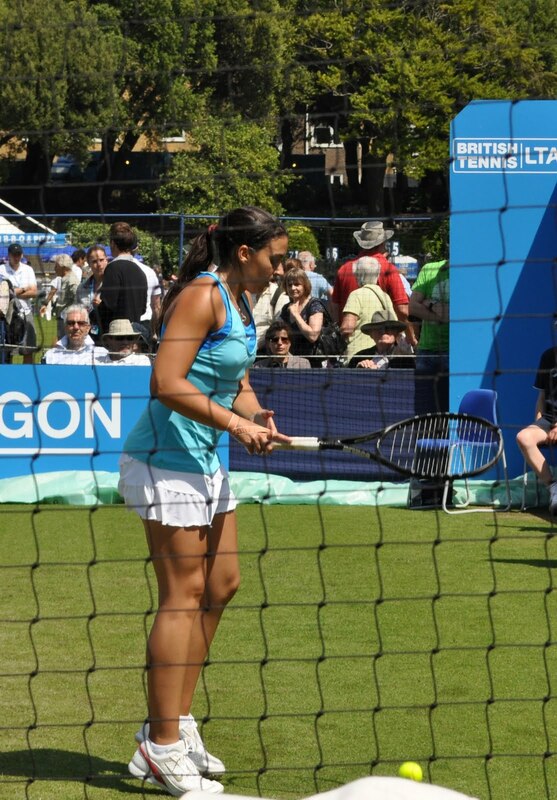 Whilst watching this match, you could hear Marion Bartoli screech her way through an epic match with Lucie Safarova. I lost count of the number of “allez” screams I heard! I only managed to watch a few points of this match but both players were hitting the ball with some real force and the match amassed a huge crowd by the end. I also went and saw a little bit of Anastasia Pavlyuchenkova and Bojana Jovanovski. Pavlyuchenkova is one of my favourite players on the tour and I think she is a future grand slam champion in the making. However on this showing, many would have argued that! She lost 7-6 6-4 to another talented youngster, Jovanovski who hits the ball incredibly hard. Unfortunately you needed earplugs to watch the match as Jovanovski sounded she like she was getting shot after every hit of the ball! I then visited the practice courts once again and was delighted to get a shot of one of my new favourite players, Peng Shuai. Peng has had an incredible start to the season winning an amazing 39 matches on tour in 2011. She has a really solid game and seems like a nice person so therefore i like her! I also got a shot of Agnieszka Radwanska who was practising her serve and being hastled by some kids who wanted the tennis balls she was playing with. 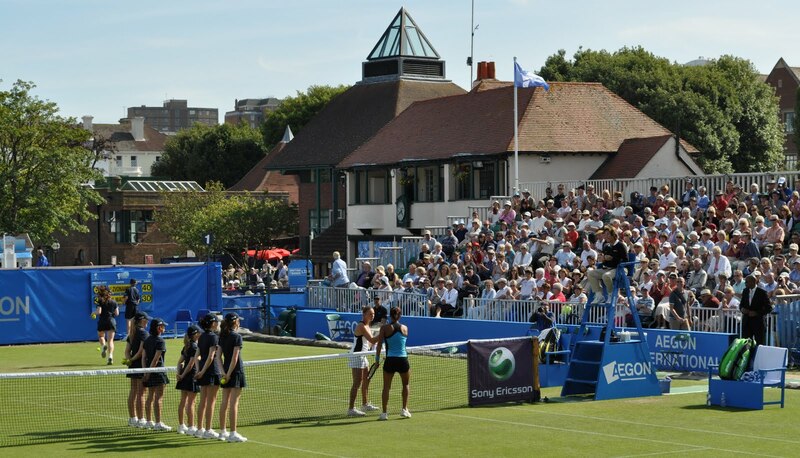 June 16, 2011 in Bartoli, Eastbourne, Jovanovski, Pavlyuchenkova, Watson, Zvonareva.